Quokka by David Burton on Flikr. I do love all animals, but there is something about this little marsupial that makes me smile and want to scoop it up and cuddle it silly. It is a small macropod, the same family as kangaroos and wallabies, and it jumps. 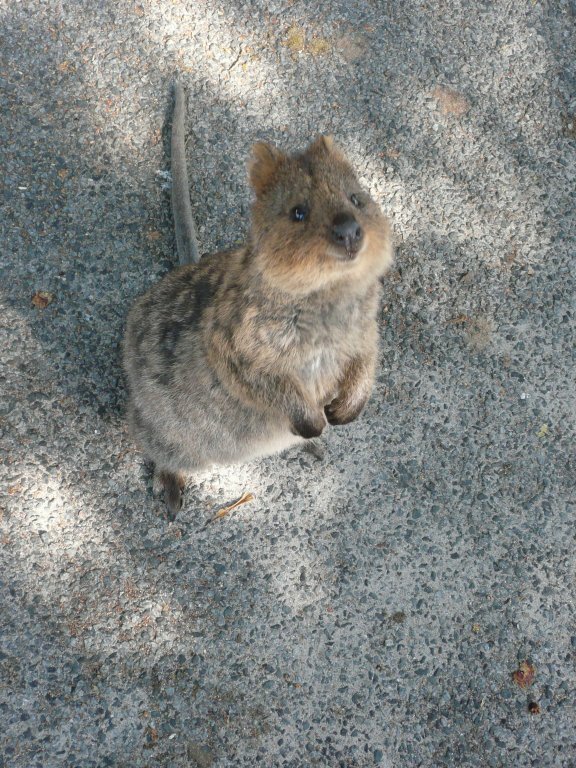 It is about the size of a domestic cat and it is nocturnal and herbivorous – quokkas have no fear of tourists and approach them to exploit the easy food that comes with them. Which is not doing it any good. Fines have been set in place to stop tourists handling and feeding them. Quokkas eat grasses, seeds and roots and they swallow them like a ruminant and regurgitate to chew the cud later – so the sorts of food given by humans will upset their highly specialised digestion. For instance, quokkas can survive without water – if it is there they drink it, but can go months without a drink by reusing some of their waste products. Another unusual thing about them is that they can climb trees up to 1.5 m.
Hard to resist. Photo by Blacktulip on Flikr. Introduced species such as cats, dogs and foxes, and dingoes have decimated the quokka on the mainland, and they now live mostly on two offshore islands that are free of predators. Images © photographers as specified above. I can’t believe I’d never heard of a Quokka before. I thought I knew all the cute, fuzzy animals. But now that I’ve seen one, I WANT ONE!!!!!! Man, they sure are adorable! I’ve never heard of a Quokka either! What a cute animal. Haven’t heard of these but they are adorable. What an interesting little critter. Visiting from the A to Z.
Hello! I’d never heard of them before, either! Dear wordstock, I have visited your blog, what an incredible story, but I can’t comment as it is the type of Blogger blog that won’t let me, I don’t know why! Comments just disappear. Can’t even ‘like’. but it’s extraordinary, and good luck! Hi Maria – I’ve been in to look at your book and your blog, and can tell you I have many quirks! Sadly your blog too is one I can’t comment on, the Google comment box flashes up and then disappears, no matter how many times I try, think we are incompatible! That second photo looks like a squirrel with a thin tail! I like your seventh line – funny and clever! Thank you, Liz! He’s actually rather a chubby little thing. Probably don’t know about them! Let’s hope it stays that way, the last thing they need is loads more tourists feeding them biscuits!